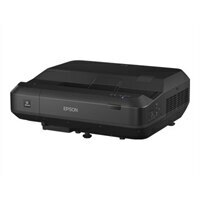 Epson Home Cinema LS100 Home Theatre Projector - HD ProjectorWith a TV, there's no getting away from the big, black screen, but a projected display can disappear at the touch of a button. So, forget unsightly screens: choose the EH-LS100 to maintain the look of your home while still enjoying all of your favorite shows. With a flexible display that can range from 70 to 130 inches, you can enjoy everything from movies to sports and games, at a size that works for you. Unlike standard throw projectors, this ultra-short-throw laser projector can be placed very close to the display area (just 5.6 cm), to create an image of up to 130 inches. Connect DVD players, games consoles and more, using the three HDMI inputs (including one MHL). With the iProjection app, it's effortless to control the projector. With 3LCD technology, you can enjoy vivid and lifelike images using this 4,000 lumens projector that has an equally high White and Color Light Output (CLO). Delivers defined shadow detail and deep blacks with its 2,500,000:1 contrast ratio. In addition, Detail Enhancement provides sharper and smoother pictures. With a TV, there's no getting away from the big, black screen, but a projected display can disappear at the touch of a button. So, forget unsightly screens: choose the EH-LS100 to maintain the look of your home while still enjoying all of your favorite shows. With a flexible display that can range from 70 to 130 inches, you can enjoy everything from movies to sports and games, at a size that works for you.